LG A380 user guide manual for AT&T – LG A380 is simple flip phone for AT&T with basic features and was released on March 2014. LG A380 entry level phone come with enhanced mode to make call more louder and txt to speech feature for text messages read aloud. LG A380 have 1.3 megapixel main camera featuring 2x zoom and video capture and 2.4 inches main screen display with 240 x 320 resolution. 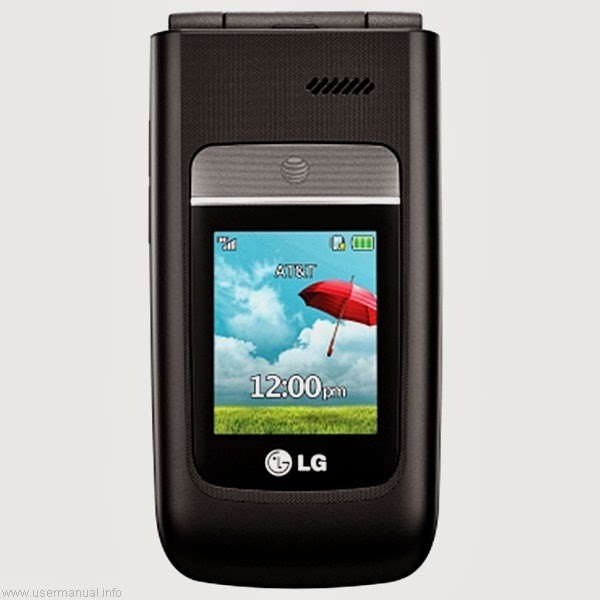 The new AT&T LG flip phone also bring some useful tools such as: alarm clock, calculator and others. LG A380 for AT&T equipped with specifications and key features such as: 102 x 52 x 17 mm (4.02 x 2.05 x 0.67 inches) in dimension with 101 g (3.56 oz) in weight, 2.4 inches TFT screen display 240 x 320 pixels resolution and 1.77 inches TFT screen display 128 x 160 pixels for secondary, microSD up to 32 GB, 256 MB internal storage, 128 MB of RAM, 1.3 megapixel camera with 320 x 240 QVGA camcorder, run 230 MHz Qualcomm QSC6270E processor, Li-Ion 900 mAH battery with up to 12 hours of talk time and up to 261 hours of stand by time. LG A380 pdf manual available to download in pdf file format with 3.6 MB size and contains of 114 pages. LG A380 user guide manual for AT&T will help users, owners and buyers with important information you need about the smartphone including key features, add functions, settings and some solution for troubleshooting.